Mandy Jenkins, an African American cook for a wealthy white family in Birmingham, Alabama, discovers her husband Cornell is having an affair with Eloise Jackson. When she confronts her husband and Eloise at a nightclub, a violent fight ensues. Eloise leaves Birmingham and relocates to Harlem, getting a job as a cabaret vocalist under the stage name Cora Smith. She is followed to Harlem by her husband, Lem, who gets mixed up in the local crime scene. Mandy also arrives in New York, having left Cornell. She gets a job as the wardrobe mistress at the cabaret where Eloise is performing. When Eloise breaks her leg during a drunken fall, Mandy is recruited as a last-minute substitute. – Adapted from Wikipedia. With Cora Green, Larry Seymour, Hazel Diaz, Alec Lovejoy. 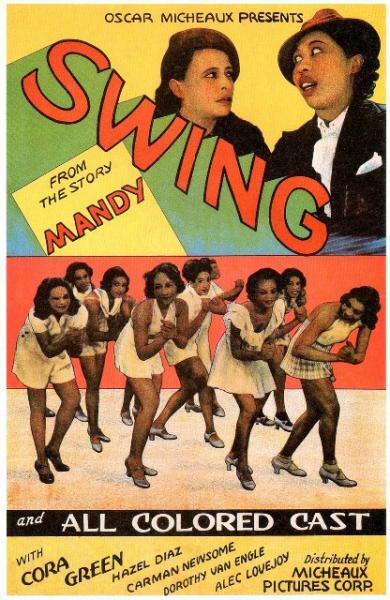 This remarkable if lesser-known work by Oscar Micheaux, arguably the most influential figure in the history of race films, is a backstage musical set amid the thriving nightlife of Harlem in the late 1930s. Though the picture is propelled by show-stopping numbers and an elaborate plot of romantic intrigue and two-timing, it is also, at heart, a narrative of migration, centering on an ingénue’s journey from Birmingham to New York. As always, Micheaux does wonders with meager means, visualizing a new black urban modernity in his own radically distinctive style, unencumbered by the codes and conventions of classical Hollywood cinema. Courtesy The Library of Congress.